The MultiMACS™ X is a fully automated, immunomagnetic cell separation system for parallel isolation of up to 24 samples or bulk enrichment from large samples. It autonomously carries out all necessary steps of the separation process: sample dilution, labeling, separation and elution of separated fractions. Your individual manual cell separation workflow will be translated into a fully automated process by implementing custom-tailored scripts that control a robotic system, the MulitMACS X. 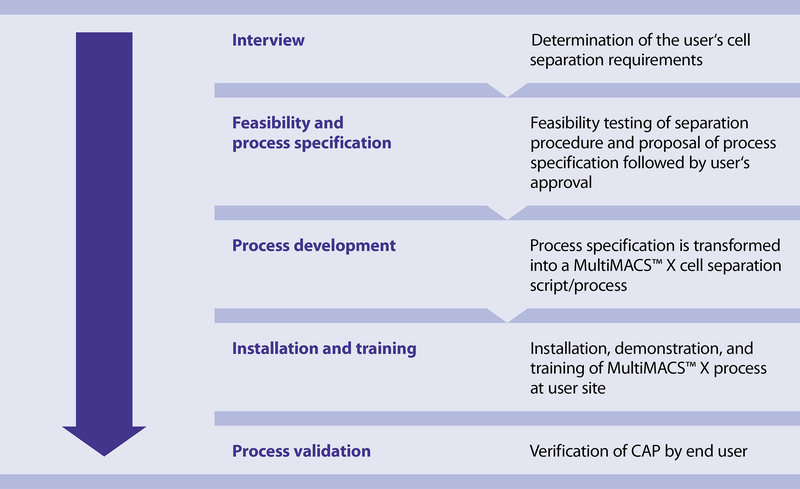 The chart shows a detailed overview of the Customized Application Service. The MultiMACS X offers sample tracking, performance reports, and more. For details on the MultiMACS X, please refer to the product page. High-throughput cell separator for fully automated magnetic cell labeling and isolation. Eager to learn more about the MultiMACS™ X?